It’s no secret that there has been an on-going war over customers in the web hosting industry for many years. Together with the technical evolution of computer hardware, this fierce competition has drastically increased what you get for your money when you buy a web hosting account. The people behind Pingdom originally came from the web hosting industry, so we tend to keep an eye on the development in that industry out of sheer curiosity (aside from the fact that we have a lot of web hosting companies as customers, so we deal with them on a daily basis). We know that the changes in what the hosting industry offers have been enormous, but we wanted to find out exactly how much things have changed. Thanks to the good old Wayback Machine, we were able to look at archived web pages of a few web hosting companies that were active 10 years ago. We selected Dreamhost, Liquidweb and Hostway, for no other reason than them being well-known today and that they were around 10 years ago. We looked at three things. The price of a regular, consumer-oriented shared web hosting account, and how much storage space and data transfer (traffic) was included in that account. And boy have things changed. Let us visualize the change for you. The image above is based on the averaged offers of the three web hosts for the shared web hosting account we described above. You can say that the term “price war” that has been thrown around isn’t necessarily what has actually been happening. The war has been one of features, adding increasing amounts of storage and data transfer. Prices haven’t changed all that much (if at all), but you get a lot more bang for your buck these days. And with a lot, we mean A LOT, as you will see if you continue reading. The hosting industry has clearly benefitted from the huge advances in hard drive technology (and of course much cheaper hard drives in general). Data transfer numbers have increased, but not as much as storage. Network capacity is apparently not keeping up with storage space. This table really shows how much more you get for your money compared to ten years ago. There has been a lot of discussion about overselling (i.e. offering more than you can actually deliver to everyone), and some of these numbers do indicate this to some extent, at least those of Dreamhost. It’s hard to look at these numbers without thinking that, so that is why we mention it. To be fair, they have gone on the record in their blog explaining the practice and their reasoning behind it (similar to mobile carriers not having capacity to handle everyone calling at once). Anyway, this article was never meant to be about overselling. It was meant to be about now vs then. Web hosting 10 years from now? We only looked at storage and data transfer here, but there are of course also other factors and features that add more value to web hosting packages these days compared to 10 years ago. We are not going to speculate what hosting will look like 10 years from now, though. Judging by what has happened in the last 10 years, we don’t even dare to guess that far ahead into the future. But please feel free to do so in the comments! Using the “Inflation Calculator” tool at http://www.bls.gov/cpi/ and 1997 to 2007, $16.28 in 1998 would be worth about $21.03 today. That’s a price decrease in real terms of 62%. It would be interesting to calculate infrastructure and labor costs over the years. The scary thing about web hosting is constantly keeping up with and migrating to bigger and better technology. It’s amazing. 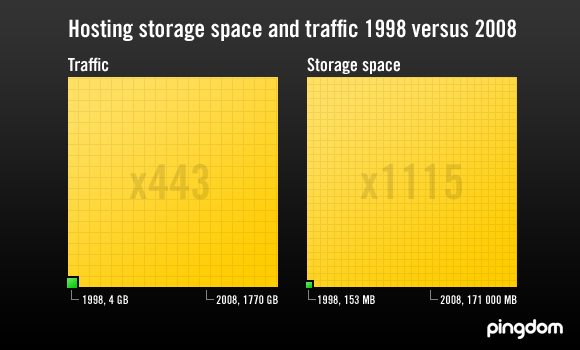 In 10 years you have more than 2 orders of magnitude difference! 3 in some cases. Assuming this keeps up it kinda makes you wonder about 2018. That or the bandwidth/storage will just be a commodity and the hosting companies will need to start competing more and more on service since the fixed costs will become negligible. I pay much less than that for shared hosting — I paid around 140$ for 5 years, making it around 2.5$/month. You have a point, but on the other hand you have had to tie yourself up for 5 years to get that price. Many web hosts offer discounts if you sign up for a long time. You’re right, we didn’t take inflation into account (it didn’t occur to us, to be honest 😉 ). To our defense, doing an advanced calculation of all the factors involved (infrastructure, labor, etc, not to mention all other things that are included in hosting packages) would be a bit outside the scope of this article. It would be interesting to see a thorough study of this, though. We chose to focus on data transfer and storage space because they are probably the two biggest factors that people tend to look at. > It’s amazing. In 10 years you have more than 2 orders of magnitude difference! Anyone who’s read any of Ray Kurzweil’s books will not find this amazing, but expected. Growth in this and all known “knowledge contexts” is exponential – not only that, the growth of the growth is exponential. 2018 will be an interesting year, to be sure. How I read this comparison is that web hosts haven’t really done much in ten years but drive up some core specs. Most hosts are still hosting in the same manner and architecture that they did 10 years ago. Web hosting is a drive towards commodity. What really happened is that the web hosts, who could have been at the forefront of the hosted application space, squandered the decade offering the same old thing with little to no innovation. I think where you’ve seen hosting companies differentiate themselves is not on specs but rather on service, support and up time. Hosting the latest greatest technology is relatively easy. Keeping a website online constantly is the difficult part. One other useful factor left out of the interesting analysis is how the number of Internet users/websites have changed over the 10 year period. Obviously, there would have been an almost exponential increase in the number of Internet users/websites now compared to 10 years ago, and by extension the industry size/revenue. One should reasonable expect that in ten years, more value would be delivered per dollar costs, but then costs would be much lower and the industry would be much bigger. I teach IT to Chinese students who want to study abroad in America for college. Interestingly, part of their final grade is to make a powerpoint presentation about how technology (especially computers) has changed over the past ten years. I came across this page today, and it’s been a big help to my students looking for raw data. And how appropriate that it’s a perfect 10 year period!